and falling “in love” is one of life’s true joys. It brings a feeling of euphoria, passion, connection, and hope for a happy future. It can lead to a lifetime of loving contentment. Of course, sometimes it lapses and becomes one of our memories, sometimes pleasant and sometimes not. The “high” that comes from this feeling of loving passion, at least for some people, is so compelling that they use it to fill gaps in their lives, much as they might use a drug. Being in love, for them, can resemble an addiction. The source of an addiction is found within the person, not in the substance itself. Some people can use a drug, including alcohol, and not become addicted. Similarly, some people can enjoy the high of being in love as a positive life experience without any indication of addiction. Other people, depending on their needs, their abilities, or their backgrounds, use the euphoric feelings that come from an outside source of gratification (drugs, relationships ... or gambling, videogames – the list is endless) to create a false sense of fulfillment in their lives. They have difficulty looking within to find a way to achieve contentment, so they look outside of themselves for a way to soothe their internal feelings. Everyone does this to a degree. But when it takes on a compulsive quality that inhibits more positive life experiences and leads to negative consequences, it can be called an addiction. P eople who use relationships addictively usually harbor a sense of incompleteness in their lives – emptiness, despair, feeling lost, or sadness. They may lack a feeling of attachment to love that has roots in early childhood. They believe their feelings can be remedied through finding that comforting feeling of euphoria that comes through a love relationship. An addictive relationship has a compulsive quality about it. While a healthy love relationship implies that both partners freely choose each other, in an addictive relationship there is a compulsive drive that limits this freedom (“I must stay in this relationship even if it’s bad for me.”) There is also an overwhelming feeling of panic over the thought of losing the relationship, even if there are arguments between the two partners and both know the relationship should end. If the relationship actually ends, there are pronounced withdrawal symptoms, much like drug, nicotine, or alcohol addicts experience when they go “cold turkey.” They may experience weeping, physical pain, sleep disturbance, depression, irritability, and the feeling that they have no place to turn to now. These feelings are so intense that they might drive the person into another addictive relationship immediately. After this period of turmoil ends, however, the addicted person senses a period of triumph or liberation and they don’t typically go through the long, slow experience of acceptance and healing that characterizes the ending of a healthier relationship. Addictive relationships typically go through a process that usually starts with an innocent attraction to someone – and this quickly turns into an infatuation. The relationship addict, who is hungry for love, feels exhilarated and blinded by “love at first sight.” This turns into an excessive preoccupation with the loved one involving hours of fantasy about how the relationship might turn out. (Of course, this happens in normal love relationships also – but the degree to which this happens in an addicted relationship is enormous. This a case in which feelings control one’s life while rational thought is abandoned – and this is not a healthy style of living.) Love addicts then project all of their dreams for eternal happiness onto the loved one (most healthy people, of course, realize that they are ultimately responsible for their own happiness). These fantasies trigger the dependency phase of the relationship. The love addict then develops the fear that the relationship could come to an end, and with it, the end of hope for a happy life. These fears lead to an obsessive quest to hold on to this relationship at any cost – even if it means control and manipulation. This is when the relationship typically begins to deteriorate. The relationship addict puts so much energy into molding the relationship into what he or she needs that the other person begins to feel smothered, intimidated, and ungrateful. The loved one resents having to live to meet the needs of another person, especially when there is a feeling of control (people typically want to maximize their own life experience rather than using a great deal of their energy to make another person feel comfortable). The loved one may even express resentment in the form of lying, cheating, taking for granted, or abusing the love addict. This puts a severe strain on the relationship and it makes the relationship addict try even harder. A vicious cycle begins. Love addicts keep on trying, however, attempting at all cost to keep alive the dream of experiencing happiness through the other person. The pain of going through this can be immense. They go into denial, acting as if everything is going well. They are not able to see where the true problem lies, which is in their own unmet needs and their addictive resolution. They idealize the relationship, even though it is barely viable and not meeting the needs of either partner. A relationship addict who is at this stage of a deteriorating relationship might consider a good, healthy intervention with a professional therapist. Failing to find help can have severe mental, emotional, and physical consequences. There comes a time to make a major life change and to learn how to deal with the pain in a different and more productive way. Relationship addicts have an overwhelming need to bond with someone. This goes beyond a healthy need to connect with others. Unfortunately, this need to form an instant attachment tends to overwhelm other people and pushes them away. And it leads to poor decisions about whom to let into one’s life. Throughout the course of the relationship, the addict spends a great deal of time thinking about the other person and how perfect things will be. Even after the relationship has ended, the fantasies about getting together again may continue. Of course, a healthy love relationship also involves fantasies, but addictive fantasies have an obsessive quality about them. These fantasies tend to take over one’s day. The need to fantasize takes precedence over socializing with others, work, taking care of normal daily routines – and they tend to become dreams or expectations that must come true. 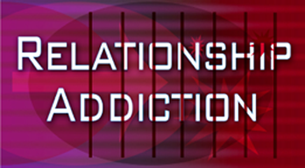 Addicts in general crave getting “high.” Relationship addicts base their ideas about a relationship on romance, and this involves creating drama. They might pick fights just to experience a rush of excitement. An ordinary argument becomes a war. They see reality in terms of their own needs, so they easily read between the lines (“No matter what she says, I know she really loves me”). A love addict fails to understand that a normal relationship involves a series of highs and lows – in real life, lows do not mean that the love has ended. They see an ordinary relationship as boring because it lacks a sense of constant excitement. Relationship addicts typically have fears left over from earlier experiences in their lives when they had been neglected, rejected, or abandoned. Their greatest fear in adulthood is feeling lonely because this reminds them of their earlier negative experiences – and they never want to endure that again. They need to feel attached and find it difficult to live independently. So, in their relationships they tend to look constantly for signs that things are not going well. They become possessive of their partner, experiencing anxiety when the partner is not present, and frequently accuse or nag the partner. The relationship addict, because of difficult earlier life experiences, is confused and overwhelmed by emotions. For example, she might feel that anger leads to rejection or abandonment, so she doesn’t express anger and instead holds in all emotional expression – and when someone expresses anger to the relationship addict, she is unable to tolerate it. She might harbor painful feelings that seem unrelated to present circumstances. She may become stoic (relationship addicts have a great tolerance for suffering and endure substantial pain rather than face the prospect of a breakup of the relationship). Because she suppresses her normal, flexible emotional expression, she may revert to polarized expression of feelings (“all or nothing”) – for example, love or hate (but nothing in between), vigilance or complacency, fear or courage. Because many relationship addicts have issues with self-esteem, they have weak personal boundaries. They lose their sense of individuality and become enmeshed with their partner. They don’t know where their needs and emotions begin and where their partner’s end. If their partner feels happy, they feel happy. If their partner feels sad, they feel sad. If they sense that their partner wants them to be a certain way, that is what they become. They have difficulty saying “no.” Unfortunately, this sets the stage for being treated with disrespect. Addictive relationships show a lack of equality between the two partners. Howard M. Halpern. How to Break Your Addiction to a Person. 2004, $14.00, 264 pages. ISBN: 978-0-553-38249-5. Pia Mellody. Facing Love Addiction. 1992, $16.95 paperback, 240 pages. ISBN: 978-0-06250-604-7. Susan Peabody. Addiction to Love. 2005, $12.95 paperback, 195 pages. ISBN: 978-1-58761-239-8. The healthy love relationship can be viewed in terms of two independent people who come together and make a commitment to each other. They each have the freedom to live as they choose within the boundaries of the commitment, and they are loved by their partner for showing integrity in how they live. Their partner encourages them to follow the beat of their own drum. The commitment enhances each partner’s ability to experience a full life – with love, security, and support. eople who try to control their partner in any relationship usually feel insecure within the relationship. I n the addictive relationship, control becomes a major feature of the interaction between the two partners. The relationship addict simply wants her dreams to come true, avoid losing her partner, and diminish her fear of loneliness and abandonment. She does not think of herself as a controlling person, but simply as a loving person who tries to make the relationship work. Unfortunately, the control behaviors usually serve only to push the partner away – which is the opposite of what she wants. Image Management – The person who controls spends a great deal of time trying to create just the right image in order to appear perfect. This involves lying, deceit, and superficiality, and people don’t get to know the real person behind the façade. Nagging – This is a way to wear people down, and it includes giving unsolicited advice and constant criticism. The aim is to get the partner eventually to acquiesce. Diminishing – The controller diminishes the other person’s authentic self so that he or she can justify stepping in and taking control. The Silent Treatment – This is a guilt-inducing technique to get even with the partner who has stepped out of line. Isolating – The controlling person loses his grip when his partner has other social contacts that serve as sources of outside validation – so he makes sure that his partner loses these contacts. Acting Helpless – This involves avoiding any hint of independence. The helpless person uses guilt to control the partner into staying in the relationship. Verbal Abuse – There are many examples of verbal abuse – withholding praise, name-calling, blaming, accusing, judging, criticizing, trivializing, threatening, and commanding. Stalking and Physical Abuse – Control behavior can escalate to the point of danger. This situation calls for immediate action. Get help. Talk to a professional. Get out of danger.